Simply the best option you can buy! have tried different lighting options, this one works best! Absolutely worth the effort and money. I did alot of research for options for lighting the Dillon reloading presses ! There were a few options one of which was an LED strip with two way sticky tape then I didn’t think would last on the painted surface . Then I got on Double Alpha’s website and saw the Inline fabrications LED lighting system . Did a lot of research on it and watch the video I knew I had to have one . This light is very well-made has plenty of cord and a great switch to turn on and off and can be removed whenever you change it tool head just by pulling it straight up . It lights up my Dillon 550 C perfectly . The installation is easy and comes with everything you need and you will be glad that you decided to buy this lighting system . The price was amazing and the shipping with lightning fast as well . Inline Fabrication hit a homerun with this LED lighting system for the Dillon 550 . This is the third lighting system I've tried and have found it to be the best . 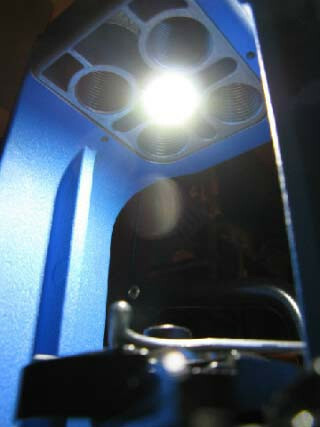 LED lighting system for the 550 - perfected. This Patent pending reloading press LED lighting system consists of a machined bushing with an embedded high output LED pod which installs into the center hole of the toolhead. Super bright, straight down focused light, out of the way, no heat and does the job perfectly. Average lifespan is 75,000 hours. Also fits the RL 450. 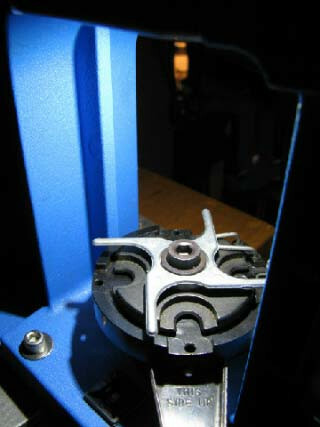 Caliber changes are quick and easy, just pop it out, change the toolhead, pop it back in and get to back work. The system comes complete with a 220/110 plug in adaptor, on/off switch, wire routing anchors and zip ties. As with all Inline Fabrication lighting systems, these have our lifetime "no worries" warranty. 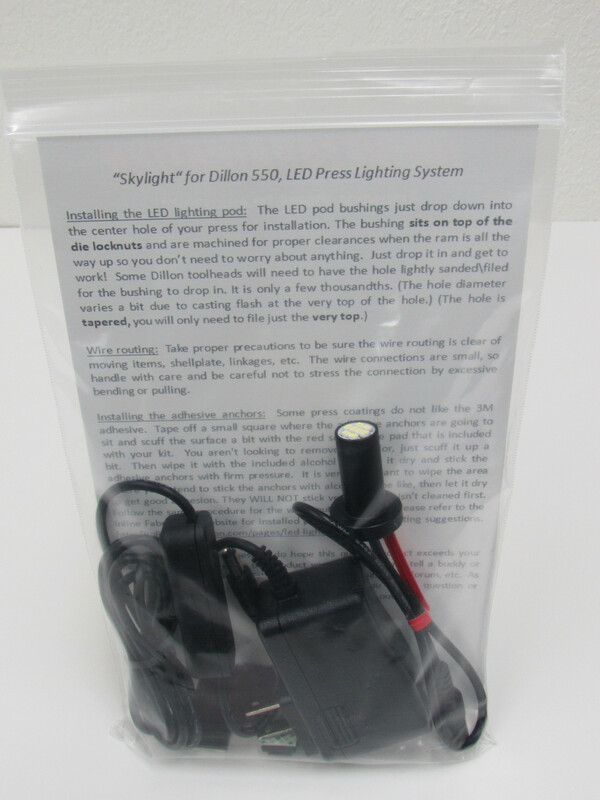 550 Skylight systems are equipped with strain relief and "drop in" installation for quick, easy toolhead swaps.